Audeh Rantisi’s family can trace their ancestry back over 1600 years in the town of Lod (Lyddia). And yet his family have now been refugees for some fifty years. 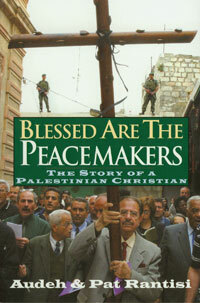 Blessed are the Peacemakers tells the story behind the headlines: the joys and pains of the Palestinians, 10% of whom are Christians. Deep down where it is important, my Jewish brothers and I are very much alike. We have the same need for security and the same need for acceptance. We must now learn to provide for others’ security and well-being . . . In the final analysis Muslims, Jews and Christians must sit together and discover solutions that will honour all. As a follower of the Prince of Peace, I want to be an agent of reconciliation however possible. This book is reconciling and honest. There is no hatred towards Jews but a criticism of Israel and Zionism. Not a single point is false or overstated. The time has come and is long overdue for this voice to be heard and heeded. [Audeh] has turned painful memories and deep psychological wounds into a driving force in his life, he is a typical ‘wounded healer’.